- Infinity joins forces with Spanish eMobility group AEDIVE in a continued drive towards European and Spanish initiatives. - The European Commission has published its 4th State of the Energy Union Report with a keen focus on the lithium-ion battery industry. - Battery materials and specifically lithium chemical supply within Europe has been identified as imperative. - Infinity’s San Jose Lithium Project is a large, potentially long-life vertically integrated industrial chemicals project. April 12, 2019 – Infinity Lithium (http://www.commodity-tv.net/c/search_adv/?v=298809) has joined forces with AEDIVE to support the development of Electric Mobility in Spain. Created in April 2010, AEDIVE is the Spanish business association for the development and promotion of electric vehicles whose goal is to support and accelerate the development of the Electric Mobility Market. The group gathers industrial, technological and service companies across the value chain of the Electric Mobility sector. One of the key goals of the cluster is to represent and promote its associate members and advocate for an economic, political and social support of Electric Mobility. The association includes around 150 members including companies such as BMW, Jaguar Land Rover, Nissan, Mercedes, and Total. The group has strong associations with federal, regional and local governments in addition to leading market participants. The European Commission (‘EC’, or ‘the Commission’) published the fourth State of the Energy Union report on 9 April 2019, important mechanism that highlights and monitors the implementation of the Juncker Commission’s key energy priorities. The Commission also presented forward visions including one on the strategic batteries plan for Europe. This dependency is not only limited to LIB cell production. Access to the five essential battery raw materials (lithium, nickel, cobalt, manganese and graphite) is also a major challenge for Europe’s security of supply as they are only currently available from a small number of countries worldwide and very limited within Europe (Figure 1). The EC now proposes the launch a dialogue with Member States through the Raw Materials Supply Group and the High-Level Steering Group of the European Innovation Partnership on Raw Materials (EIP Raw Materials). A key output of the first raw materials mapping exercise by the Commission is that Europe lacks a processing facility for lithium, whilst noting that currently risk of availability is concentrated largely in China, which consequently dominates the LIB supply chain. Access to raw materials and essential LIB chemicals may be at risk because of political instability, which could lead to access being disrupted (including exposure to high taxes and duties on exports). 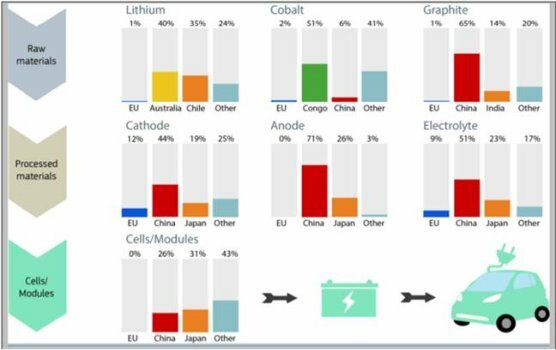 On the domestic front, the Commission has launched a dialogue with EU Member States to map the availability in Europe of raw materials for batteries, including cobalt, lithium, natural graphite and nickel. The outcome shows that despite having geological potential in Europe, extraction of battery raw materials is limited and concentrated in a few European countries. Greater use of this potential would reduce the risk to security of supply of raw materials for batteries. Furthermore, while processing capacity exists in Europe for cobalt and nickel, there is none for battery-grade lithium compounds or natural graphite. That would mean that even if lithium and natural graphite extraction can be increased in Europe, all materials – at least in the short term - would have to be shipped to countries outside Europe for processing into battery-grade materials. The 4th State Energy Union Report the Commission is working with the European Investment Bank (EIB), key industrial actors and Member States to address this gap in the value chain. The Vice President of the EC Maroš ŠefÄoviÄ and Vice President of the EIB Andrew A. McDowell both acknowledged the importance of Europe’s strategic position in the LIB supply chain, promoting the sector and the EIB’s commitment to provide capital to facilitate growth EV market and European value chain participants at EBA250 in Brussels (refer to ASX announcement 1 February 2019). Infinity’s San Jose Lithium Project contains the European Union’s (‘EU’) second largest JORC lithium resource and is projected to produce up to 15,000 tonnes per annum of battery grade lithium chemicals for more than 24 years (ASX announcement 29 November 2018), placing it ideally to supply battery grade chemicals into the European market. San Jose is currently undergoing a Pre-Feasibility level study. Infinity Lithium is an Australian listed minerals company who is seeking to develop its 75% owned San Jose Lithium Project and produce battery grade lithium hydroxide. Supply response is needed to satisfy Europe’s burgeoning energy storage needs through feeding the large-scale battery plants currently under construction. The San Jose deposit is a highly advanced, previously mined brownfields development opportunity representing one of Europe’s largest lithium deposits. Infinity Lithium will potentially mine the hard rock Mica resource and develop processing facilities to provide what would currently be the sole European mine-to-end-product lithium hydroxide operation. The Production Target referred to in this announcement is based on 91% Indicated Resources and 9% Inferred Resources for the life of mine life covered under the Study. In accordance with the twenty four (24) year mine plan incorporated into the Study, the first three (3) years of production (covering payback period) will come 96% from Indicated Resources. The Study is based on the material assumptions outlined in the ASX announcement 29 November 2018. These include assumptions about the availability of funding. While the Company considers all the material assumptions to be based on reasonable grounds, there is no certainty that they will prove to be correct or that the range of outcomes indicated by the Study will be achieved. To achieve the potential mine development outcomes indicated in the Study, additional funding will be required. Investors should note that there is no certainty that the Company will be able to raise funding when needed however the Company has concluded it has a reasonable basis for providing the forward looking statements included in this announcement and believes that it has a “reasonable basis” to expect it will be able to fund the development of the San Jose lithium deposit. Production Target and Scoping Study: The information in this report that relates to Exploration Results is based on the information compiled or reviewed by Mr Adrian Byass, B.Sc Hons (Geol), B.Econ, FSEG, MAIG and an employee of Infinity. Mr Byass has sufficient experience relevant to the style of mineralisation and type of deposit under consideration and to the activity which he is undertaking to qualify as a Competent Person as defined in the 2012 Edition of the JORC Code for Reporting of Exploration Results, Exploration Targets, Mineral Resources and Ore Reserves. Mr Byass consents to the inclusion in the report of the matters based on this information in the form and context in which it appears.